Ahhh, the joys of summer. I'm sitting here on a Saturday morning, enjoying an unusually cool interlude before the heat of the day sets in, listening to the cicadas buzzing their little buggy butts off on the trees in my yard. And I keep chuckling about something that happened in class yesterday afternoon. Now, summer in central Japan is bug heaven. There are cicadas on the trees, flying beetles of all kinds, butterflies everywhere. There are thousands of roly-poly pill bugs in my yard. There are also poisonous caterpillars, nasty paper wasps and painfully aggressive centipedes (but, interestingly enough, there are virtually no house flies at all - and no miller moths!). Go into any home center or supermarket and see the nets and bug cases for kids to catch and collect cicada or other critters like praying mantises. 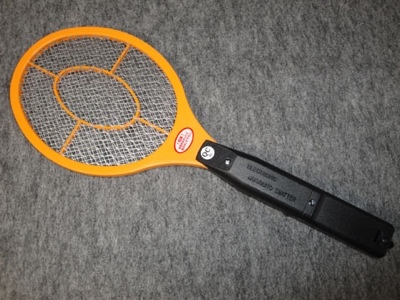 Just think, you can practice your tennis game as you get rid of pesky mosquitos! Forehand? SNAP! Backhand? CRACKLE!! The smash? POP!!! Watching this kid rubbing his snozz and snorting while telling me that, I just died! I laughed until tears rolled down my cheeks (no, not those cheeks, potty mind!) and the boy had a rueful grin on his face.